Hibernian comfortably beat Dumbarton to move up to second in the Scottish Championship. Franck Dja Djedje converted Keith Watson's cross to give Hibernian the lead. 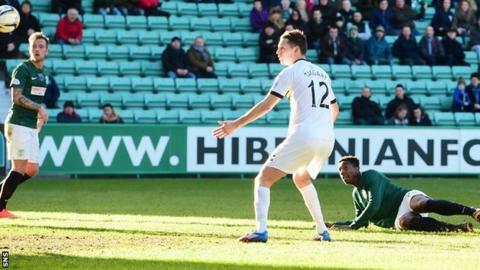 And, soon after, Dominique Malonga headed in another Watson delivery to double Hibs' advantage. Malonga added another after the break, this time finding the net with a shot, and Alan Stubbs' side lead Rangers by two points in the division. Match ends, Hibernian 3, Dumbarton 0. Second Half ends, Hibernian 3, Dumbarton 0. Conner Duthie (Hibernian) wins a free kick in the defensive half. Foul by Darren Petrie (Dumbarton). Attempt missed. David Gray (Hibernian) right footed shot from the right side of the box is too high. Substitution, Hibernian. Conner Duthie replaces Daniel Handling. Daniel Handling (Hibernian) wins a free kick in the attacking half. Foul by Mitchel Megginson (Dumbarton). Substitution, Hibernian. David Gray replaces Lewis Stevenson. Substitution, Hibernian. Martin Boyle replaces Dominique Malonga. Substitution, Dumbarton. Darren Petrie replaces Scott Linton. Corner, Hibernian. Conceded by Mitchel Megginson. Attempt saved. Franck Dja Djedje (Hibernian) right footed shot from the right side of the box is saved in the bottom right corner. Garry Fleming (Dumbarton) wins a free kick on the right wing. Corner, Hibernian. Conceded by Mark Wilson. Attempt blocked. Fraser Fyvie (Hibernian) right footed shot from outside the box is blocked. Garry Fleming (Dumbarton) wins a free kick in the attacking half. Attempt missed. Fraser Fyvie (Hibernian) right footed shot from outside the box is close, but misses to the right from a direct free kick. Attempt missed. Franck Dja Djedje (Hibernian) right footed shot from outside the box is just a bit too high. Attempt saved. Garry Fleming (Dumbarton) header from the centre of the box is saved in the centre of the goal. Attempt missed. Daniel Handling (Hibernian) right footed shot from outside the box is just a bit too high. Attempt missed. Dominique Malonga (Hibernian) right footed shot from outside the box is close, but misses to the right. Scott Robertson (Hibernian) wins a free kick on the right wing. Scott Robertson (Hibernian) wins a free kick in the attacking half. Attempt missed. Scott Linton (Dumbarton) right footed shot from outside the box is close, but misses to the left. Substitution, Dumbarton. Chris Duggan replaces Dylan Easton. Substitution, Dumbarton. Chris Turner replaces Mark Gilhaney. Goal! Hibernian 3, Dumbarton 0. Dominique Malonga (Hibernian) right footed shot from the right side of the box to the top left corner. Corner, Hibernian. Conceded by Stuart Findlay. Corner, Hibernian. Conceded by Scott Linton.